Magnetic elements such as iron typically do not superconduct, and their magnetic nature has been considered incompatible with superconductivity. With the discovery in 2008 of the iron pnictide superconductors, however, a new set of problems concerned with the nature of the superconducting state has been under intense investigation. 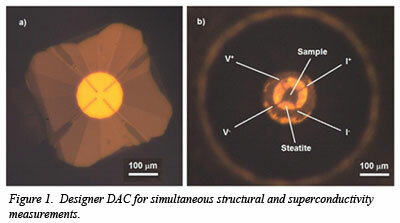 In particular, the iron-based superconductors have transition temperatures that are extremely sensitive to applied pressure, which suggests that there is a strong correlation between superconducting properties and crystal structure. 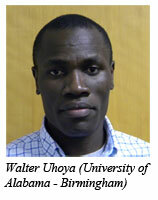 CDAC graduate student Walter Uhoya from the University of Alabama – Birmingham (UAB) and colleagues from Illinois Wesleyan University, Institute of Physics at Taipei, Lawrence Livermore National Laboratory, HPCAT and UAB, have shown that designer diamond anvil technology (Fig. 1) for the measurement of electrical resistance can be used at a synchrotron source to perform simultaneous structural and electrical resistance measurements directly at high pressures and low temperatures (Fig. 2). The group performed the experiments on a sample of the compound FeSe0.92 at pressures up to 74 GPa and temperatures down to 4 K at beamline 16-ID-B (HPCAT) at the Advanced Photon Source, Argonne National Laboratory. The results showed that the tetragonal phase present at ambient conditions transforms to an orthorhombic (Cmma) phase at ~ 90 K, and the Cmma phase becomes superconducting at ~8.5 K. The superconducting transition temperature (TC) increases rapidly with pressure reaching a maximum of 28 K at ~6 GPa. Surprisingly, the maximum in TC corresponds to an onset of a pressure-induced transition from the Cmma phase to the Pbnm phase reported concurrently at 6 GPa at low temperatures. Above 6 GPa, TC decreases gradually with increaseing pressure, disappearing completely at 14.6 GPa where the compound adopts the Pbnm phase. The gradual decrease of TC between 6 and 14.6 GPa coincides with a gradual distortion of the FeSe4 tetrahedral layers in a mixed phase region where Cmma and hexagonal P63/mmc phases continuously transform to the Pbnm phase. This work documents the existence of four distinct phases in the P-T phase space investigated and shows that superconductivity occurrs only in the Cmma phase. 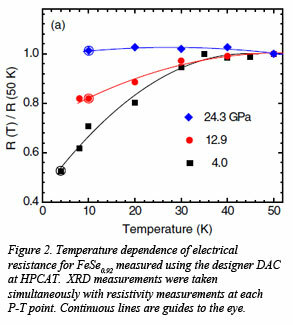 The results and new methodology reported by the group are highly beneficial for ongoing studies aimed at understanding the phenomenon of high-temperature superconductivity and its response to crystallographic modulations under applied pressure [W. Uhoya et al, Europhys. Lett. 99, 26002 (2012)].